For those of you that don’t get into watches, this title is probably just an abstract equation. However, for the watch freaks like myself, the title is a celebration of sorts. It’s the celebration of a modern company, Tag Heuer, that got it right when it comes to a re-release. 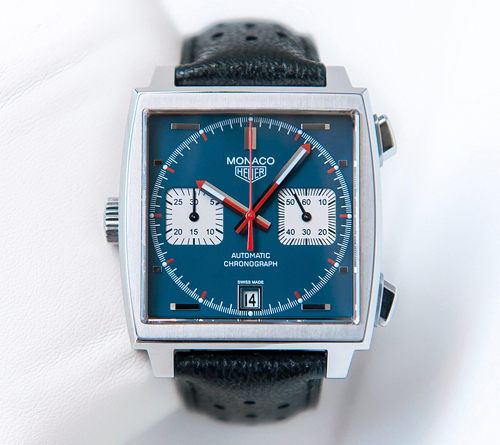 What they created with the Heuer Monaco 40th Anniversary is a balance of past style with modern refinement that rarely occurs in any product, let alone a watch. 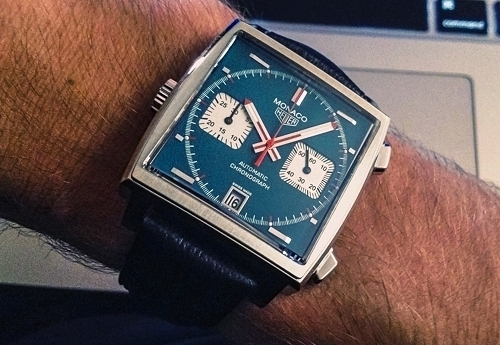 Ever since Steve McQueen wore a Heuer Monaco at Le Mans in 1969, men have wanted that watch. Its blue square face and white square subdials have become synonymous with racing to a level that the “Most Interesting Man in the World” aspires to reach (take that Dos Equis). To those like myself that can barely read an analog watch, the mechanics and time keeping abilities play a far distant role of importance to the style. Some may say the timepiece represents a man, and others may say it represents a time when the concept of cool had never been more realized, regardless it represents refinement, and no watch collection is complete without it. Unfortunately, finding this watch is another conversation all together. Some may say that it will take years, while others will say it takes fate, for me it was the latter. I was out shopping with a friend who was going to buy a new watch when the salesman said he had a watch that I needed to see. When he opened the box, there wasn’t an audible “ahhhhhh” like one would expect, but a broad spotlight did shine down upon it. I never watched Lord of the Rings, but I’m pretty sure this thing was my precious. Will I keep it forever? Probably not. However, the point isn’t to have everything in life, rather to have enjoyed the many things that life has offered. Now THAT’s style. But, holly chronograph Batman! I ’bout choked when I saw the price tag. That would be like walking around with two 5DMIII’s gaff taped to my wrists.